First off, can we discuss how excited I was to discover this random palm tree while shooting? Palm trees are super rare (if not unheard of??) in Canadian climate so it was most certainly worth a snap! And it couldn't have tied in more perfect with today's dress! 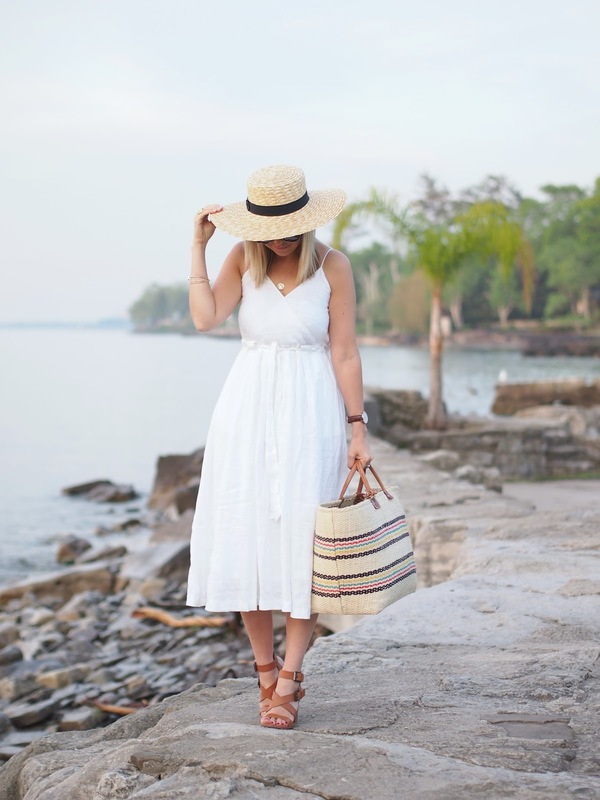 This white linen number is absolutely darling for summer. I love the length and the fact that you can cinch or let out the waist with the adjustable belt. The linen fabric is a cinch for packing as well if you have any summer destinations planned! Gorgeous dress and I love how you styled it! Beautiful! I lovvve this! The length of the dress is so perfect with these sandals (which I already own, so now I'm thinking I need a white midi dress!) And that's nuts that you found a palm tree! I didn't know they existed at all in Canada! Great look, girly! And I love how you adjusted the top. Looks gorgeous! Great for a casual weekend! I love how wide-brimmed that hat is! So pretty with the all white look! This is such a pretty Summertime outfit! You look beautiful in this dress! what a sweet, pretty dress! And DW watch - I love this brand. So simple and so beautiful.